The 4th of July just wouldn't be complete without a red, white and blue outfit. This cute t-shirt was super simple and you can have it ready to wear in about an hour! 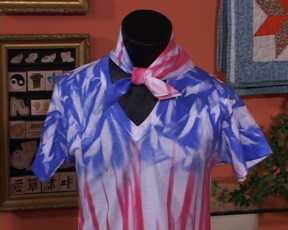 Grab your red and blue Tulip Fashion Spray and a t-shirt and a white bandanna. Cover your table with plastic before you get going. Next, lay the shirt on the table and pinch the bottom of the shirt into fan folds, and scrunch the top of the shirt. This will make it look like stars and stripes when you're done. Now, spray red on the bottom of the shirt and blue on the top. Do the same thing to the bandanna. Wait until they're dry and then flip them over to do the back. Let them dry completely, and you're ready to add a cute denim skirt or shorts. The bandanna is cute around your neck but it would look really adorable around a ponytail, too. All you need now is a sparkler in one hand, and a piece of apple pie in the other!